This is going to be an unpopular review as most have found this film to be delightful. Normally a fan, I must be Baumbached out. Already this year we’ve had Baumbach’s While We’re Young and the Baumbach-esque Listen Up Philip and so patience for send ups of narcissistic, pretentious New Yorkers wore thin halfway through this unengaging but admittedly energetic comedy. Baumbach and co-writer/partner Gerwig (teaming up again after Frances Ha) have got a personality type in their sights: Educated, well-read people who revel in perpetual self-promotion, self-absorption, inch-deep positivity and fake empathy. People who speak in Twitter posts and Facebook comments: everything is either a ‘fact’ or an opinion (it’s not hard to imagine the emoticon after every sentence). A conversation can change from frozen yoghurt to a dead mother and back again because everything is of equal importance/of no importance. “Like most of your generation, everything is pastiche,” a woman says at one point. These people act like they’re in their own movie with themselves in the lead - there’s talk about ‘my character’ and ‘playing my part’ – and yet are completely unware of their behaviour. They live in a vacant world of high drama. These people are all surface. And so is the movie. Deliberately so, sure, but it means there’s nothing in it. 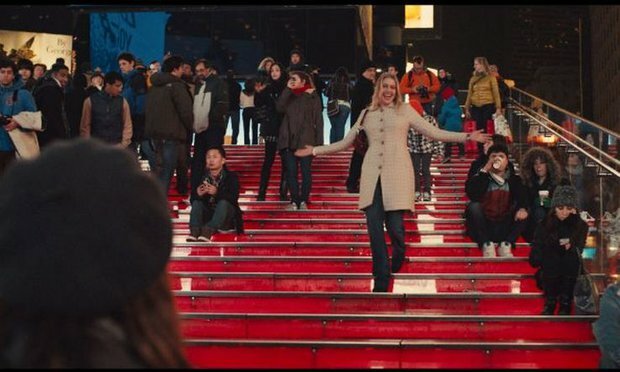 The superficial characters are only here to be sniggered at; Gerwig and Baumbach are more interested in being cute and so when they belatedly look for honest emotion - when Tracy and Brooke confront their superficiality and tears fall - it’s hard to tell if this is just another phoney moment in a life of phoney moments. Tracy and Brooke not just unlikeable, which is fine (this is a Baumbach movie after all) they’re boring, which is not. Their rapid-fire dialogue, impressive at first, becomes white noise. It has energy, though. There’s the occasional laugh too, and Galaxie 500’s Dean Wareham (who also supplies the synthy soundtrack) turning up as a nasty neighbour is a delight. But what are Baumbach and Gerwig trying to say? That these people are ghastly? Yeah, and? Baumbach’s repeating himself here: his While We’re Young was sharper and Alex Ross Perry’s Listen Up Philip was nastier.